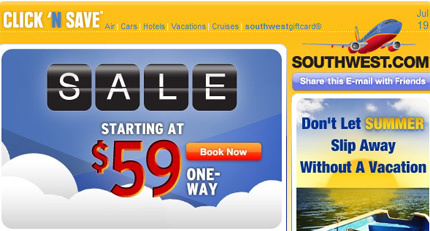 Retail Rants and Raves: Southwest Airline's Email Lies! I'm always amazed by the email I receive from Southwest Airlines - which, full disclosure here, is the ONLY airline I fly (Momma don't pay baggage fees!) They always seem to offer some too-good-to-be-true deal. And, truth be told, it IS too good to be true. I can NEVER find the advertised rate. The flights are at a minimum THREE TIMES HIGHER and up to NINE TIMES HIGHER!!! To be fair, I searched for quick weekend trip to Vegas in the near future. 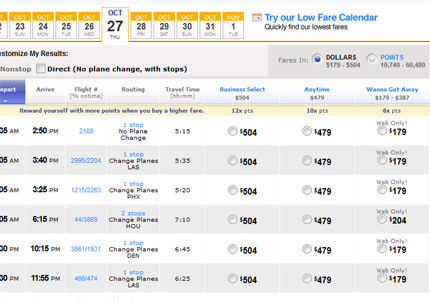 Even there, the flights were double the advertised price! FAIL SOUTHWEST. FAIL FAIL FAIL!